In my previous post, our discussion focused on acceptance of the reality occurring right in front of your eyes and the further acceptance that it was supposed to happen just as it did. Today’s post is an even higher level acceptance moving you closer to the final step in growing that acceptance into gratitude. Previously, I explained that I would look for a good reason why something happened to make it easier to accept that is was happening just as it was supposed to happen. I then grew my level of acceptance to not require that “good reason” step. “’Okay’ was my new way of living. For the first time in my life, I was completely accepting of my life as it was rolling out in front of me. In my recovery, to help me keep a positive attitude, and because I knew it was true, I looked at everything that was happening with me physically as ‘necessary for my recovery.’ I started taking that attitude into my daily life. There are things I could learn from the tortoise every day. In proceeding forward like the tortoise, slow and steady, I tended to see many beautiful things in life that I used to just walk by without noticing. This brought so much joy into my life that it opened my heart and my dopamine flow as I was working on my recovery. It occurred to me that when I was moving like the tortoise, slowly and steadily, I also had more time to notice all of the subtle unpleasant changes that were happening to my body. However, my faith was strong so I did not worry about the unpleasant changes that were occurring. Since my Parkinson’s body had limited energy, I had to trust it to know where I needed the healing the most. Some days that meant I walked a little slower, some days it meant I had more tremors, and some days it means I had a big headache. The power of ‘Okay. Apparently…’ is representative of true acceptance of what the Universe was offering me. It defeated emotional stress, anger, frustration, resentment, and fear. Instead of looking at something and getting upset, I would just say, ‘Okay. Apparently, that was supposed to happen’ or ‘Okay. Apparently, I wasn’t supposed to be doing that.’ The more I could look at unpleasant Parkinson’s circumstances and say, ‘Okay. Apparently…’ the more calm I became and less angry and fearful I became as I continued my recovery. 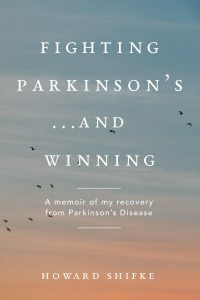 The one thing I knew I needed to keep constant in my recovery was doing the physical, mental, and spiritual parts of the Parkinson’s Recipe for Recovery every day. That way, my body could say, ‘Okay, I know you are doing these things, and I know you are generating this energy, thank you, now I can start fixing this mess.’ Faith, plus action, was key to this philosophy. I have faith in my recovery. Plus, I am taking action to heal my organs by doing the Qigong exercises. I am recovery! I have faith in my recovery. Plus, I am taking action to generate more brain activity and energy by doing the Brain Vibration Chanting. I am recovery! I have faith in my recovery. Plus, I am taking action to make my body healthier by eating better. I am recovery! I have faith in my recovery. Plus, I am taking action to balance my internal energy by doing Jin Shin Jyutsu. I am recovery! I have faith in my recovery. Plus, I am taking action to calm my mind by meditating. I am recovery! I have faith in my recovery. Plus, I am taking action to connect my Inner Divine to my Higher Power by praying, opening my heart, feeling love, joy, laughter and gratitude, and by keeping the faith that I am safe and secure. I am recovery! Getting back to moving like the tortoise takes me to the tortoise and hare story. The hare views ‘recovery’ as winning the race, only…symptom free recovery. He fails to understand that, in and of itself, recovery is participating in the race. So when the hare gets off the path toward what he sees as recovery, the destination only, he never finds his way back to the path and he never wins the race. The tortoise is recovery. The tortoise views recovery as each small advance toward the symptom-free recovery at the finish line. However, the tortoise, by its very nature, has to move slowly and steadily, and the tortoise cannot worry too much about the bumps in the road. “Okay!! !” There you have it. Apparently, it is time to grab onto the soul, mind, and body healing known as the Parkinson’s Recipe for Recovery® and stay on the path until you reach your full recovery. And, each day that you have faith and take action moving you toward your full recovery is RECOVERY in and of itself. Okay? Yes, OKAY! NOTE: This month is Parkinson’s awareness month. People have forwarded to me the information going out from many Parkinson’s organizations. It is the same gloom and doom picture of Parkinson’s followed by requests for donations for more research. We have a different message. We are a community of beautiful souls already fully recovered or recovering daily from Parkinson’s. I ask you to be ambassadors of our hope and faith message. Please help spread the positive message of Parkinson’s recovery. If you know somebody with Parkinson’s, please direct them to this website or tell them about my book. They can click here to go to Amazon to purchase a book. The only way we are going to turn the tide from gloom and doom to hope and faith is if WE DO IT! Thank you for being here, having hope and faith in your recovery, and helping spread the word of hope and faith. I am grateful for all of you. Thank you Howard, I am continuing on the path called Recovery and I appreciate all your posts! Thank you Howard for the anti Doom and Gloom message/blog it keeps me moving forward and knowing I am worth it! Godbless You, Sally and family and this great work you do! So true! Thank you, Howard. Dear God, grant me the serenity to Accept the things I cannot change, the courage to change the things that I can and the wisdom to know the difference. I thank you Howard for your wisdom. Keep on keeping on. What a massive missive. I’ll be chewing on this all week! It’s interesting how the more I chew on it, the more I get out of it. Thanks for this nutrition for my mind, body and soul. Great blog again, thank you Howard. Looking forward to eventually celebrating pd-recovery awareness day/month/year! Another great post of faith and hope! Beautiful, articulate and right on the money as usual. You are a glorious human being Howard. I’m very grateful to have discovered your book and you. Howard thanks for a great post. I continue to have faith. I like your okay. There is always a reason. I needed it today.